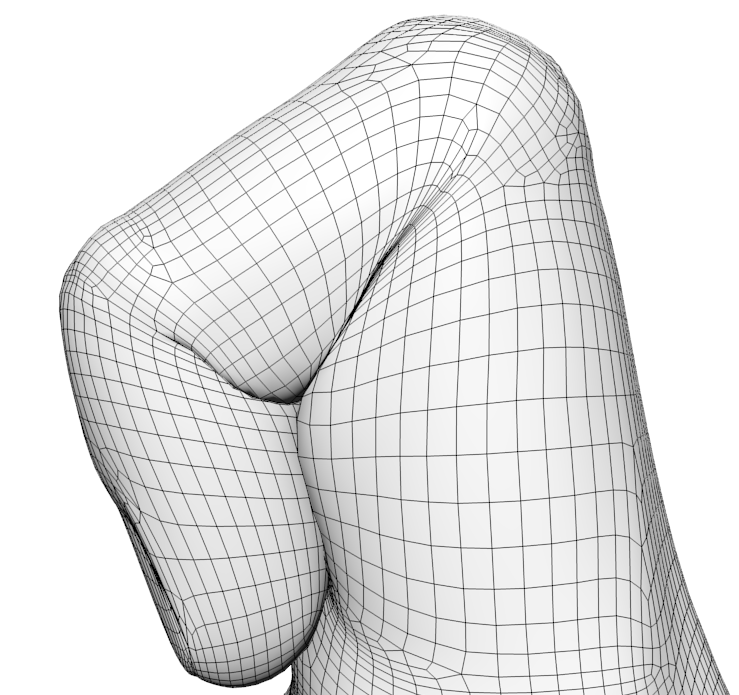 (a) Self-intersection of the Armadillo's knee with dual quaternions skinning. 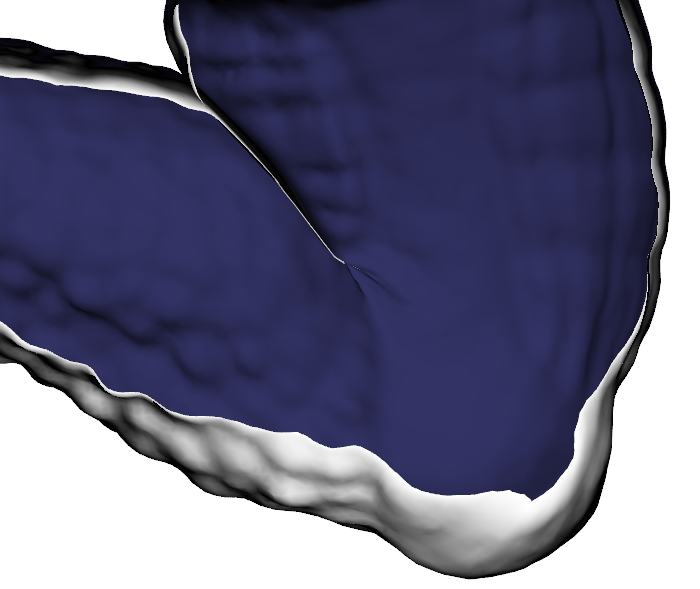 (b) Implicit Skinning produces the skin fold and contact. 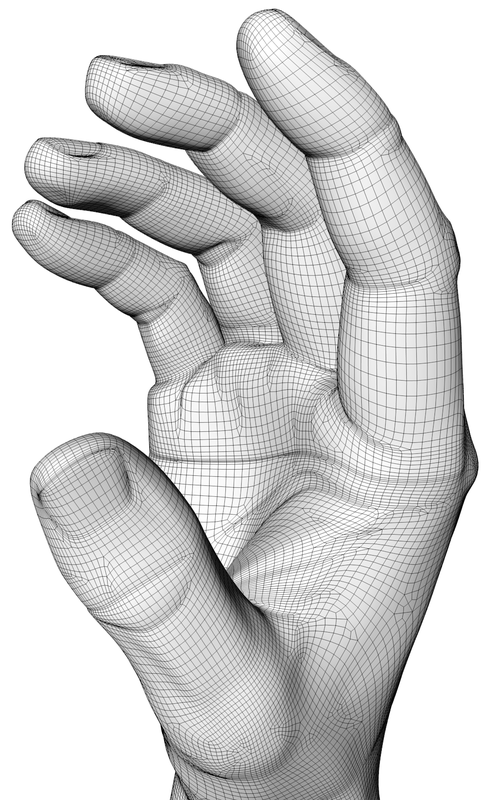 (c), (d) two poses of the finger with Implicit Skinning generating the contact surface and organic bugle. (e) Implicit Skinning of an animated character around 95fps. We present Implicit Skinning a real time method for character skinning. The technique is a post process applied over a geometric skinning (such as linear blending or dual-quaternions) which handles the self-collisions of the limbs by producing skin contact effects and plausible organic bulges in real-time. In addition we avoid the usual collapsing or bulging artifacts seen with linear blending or dual quaternions at the skeleton's joint. To achieve these effects we need a volumetric representation of the mesh. Implicit Skinning's idea is to use a set of implicit surfaces (3D distance-fields/scalar-fields), rather than tetrahedral/voxel mesh and a slow physical simulation. 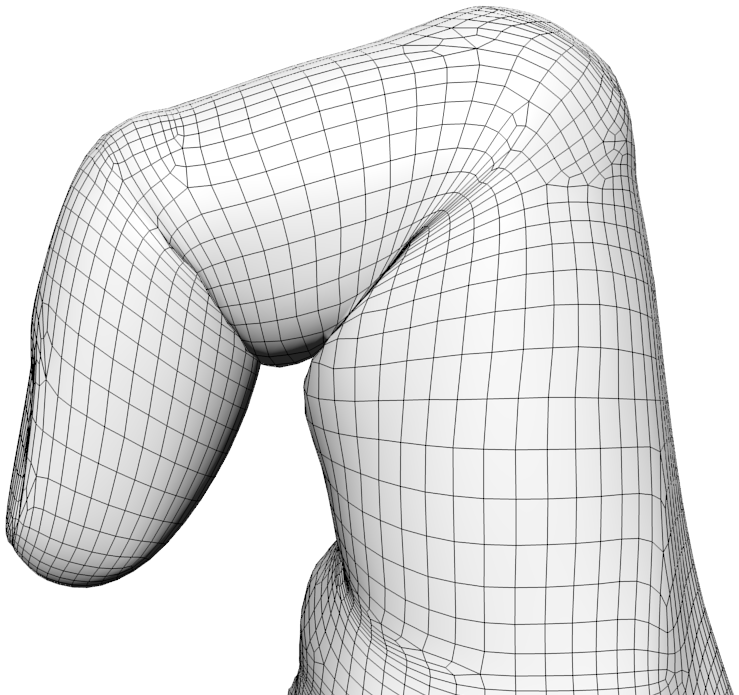 For each limb, we automatically generate the implicit surface shape, and use it to adjust the position of the geometric skinning's vertices without loss of details. As Implicit Skinning acts as a post-process, it fits well into the standard animation pipeline. Moreover, it requires no intensive computation step such as an explicit collision detection between triangles, and therefore provides real-time performance. Disclaimer: the standalone application is written in Qt/C++ and CUDA, therefore it only works on NVIDIA GPUs but should run on Windows or Linux. This code is a research project developed on three Linux machines with similar configurations and "tested" by very few people: expect difficulties to get it to work. The documentation is also very thin. That being said I will be happy to answer specific questions in case of troubles. 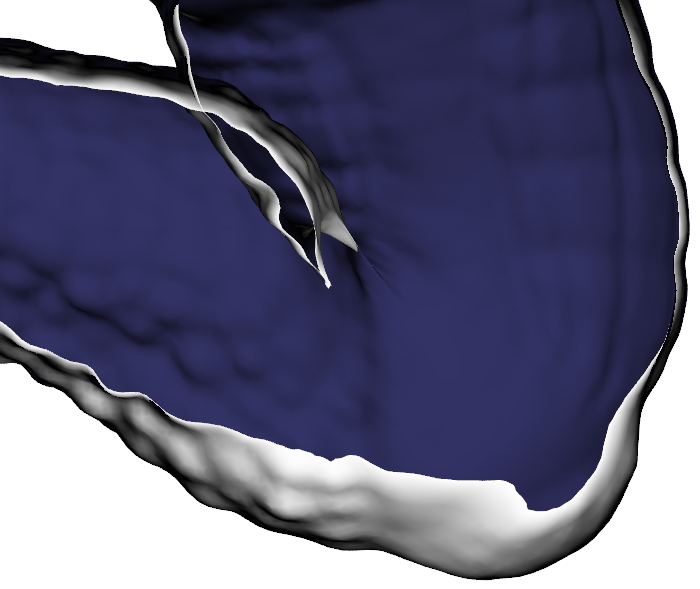 The Implicit Skinning project has been partially funded by the IM&M project (ANR-11-JS02-007) and the advanced grant EXPRESSIVE from the European Research council. Partial funding also comes from the Natural Sciences and Engineering Research Council of Canada, the GRAND NCE, Canada and Intel Corps. Finally, this work received partial support from the Royal Society Wolfson Research Merit Award. We thank artists, companies and universities who provided us with nice 3D models. Juna model comes from Rogério Perdiz. Dana and Carl models from the company MIXAMO. 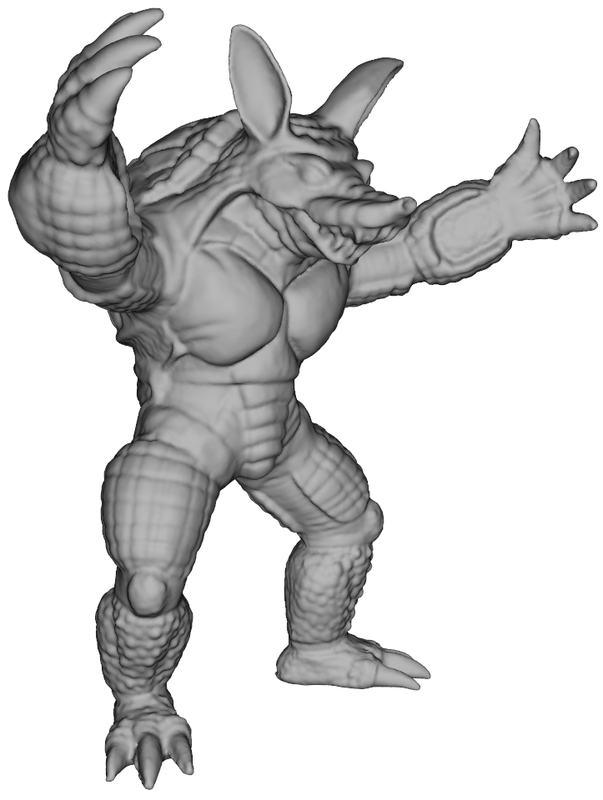 Finally the famous armadillo model comes from the Standford university 3D scan repository. We also thank the blender foundation for providing everyone with the Blender software which we used to do some of the enhanced rendering in the video. Rendering setup is a modified version of the Sintel Lite rendering setup. "Don't add a new topic to the end of an old one - there's a great risk you'd go unnoticed....."